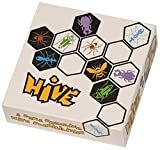 The rules are exactly the same as the original Hive except a player can either choose to place, move or flip a piece. You can choose which side to play face up except with the Queen Bee which must always be placed facing up. You can only move or flip a piece once the Queen has been placed. 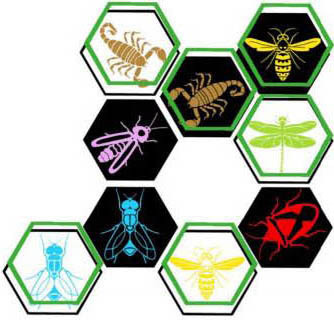 The game is won when either a player's Queen Bee or Wasp has been surrounded. Flipping You can flip a piece even if it cannot move but not if it is under a stack, or was moved by your opponent on their previous turn. We recommend playing without the Mosquito, Ladybug or Pillbug expansions whilst you gain some experience of the new, reverse side creatures and familarise yourself with the flipping mechanism. 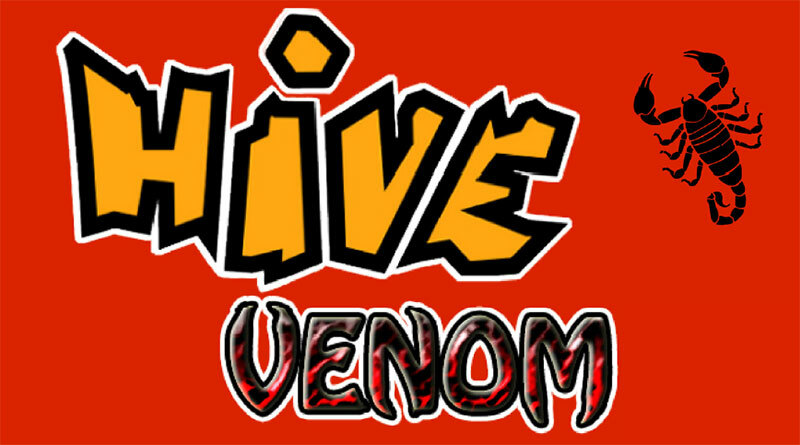 Alternatively, you can choose to odd any number of the venom pieces to the original Hive gome os additional expansion creatures. 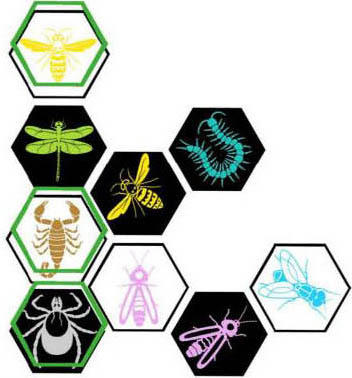 The Wasp moves one space around the Hive. Or, instead of moving, it can use its special ability to sting any enemy piece that's not in a stack. 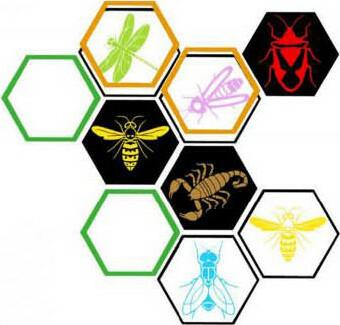 The stung piece is immediately flipped and is unable to move, use its special power or be re-flipped for one turn. The Wasp cannot sting a piece that has just moved or flipped by your opponent. 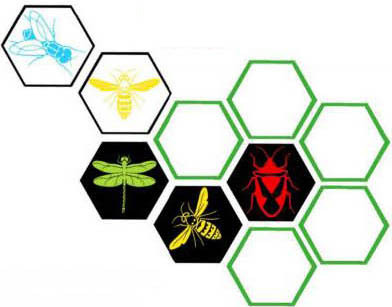 The orange hexes are the bugs that the Queen Bee can sting. The Firefly moves two spaces up on top of the Hive from the ground level. When on the Hive it moves one space until it drops down. It cannot move around the Hive at ground level. 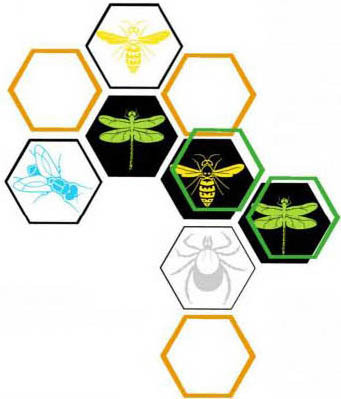 The Dragonfly moves one space up onto the Hive. 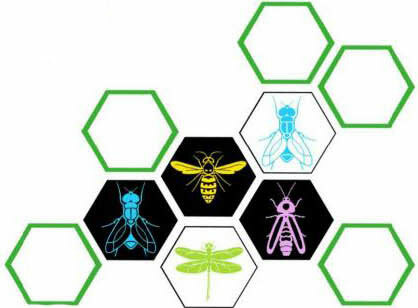 Once on top of the Hive it must then move onto any adjacent piece and continue moving in a straight line in the same direction until it drops back down to ground level at the end of the row. 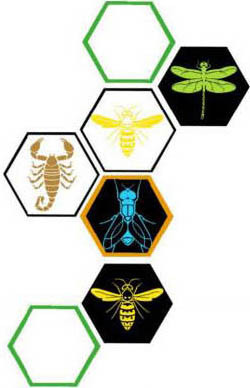 The Scorpion moves exactly two spaces around the Hive. Additionally it suppresses any adjacent enemy bug so that they aren't permitted to flip (see the orange outlined black Fly), with the exception of the Shieldbug which is immune to the Scorpion's attack. When the Scorpion is covered its powers are disabled. The Fly can fly from any position to land on any bug that that your opponent placed,moved or flipped on their last turn. This includes bugs on top of a stack. It then moves one space down into an empty adjacent space at ground level. Here the black Shieldbug has just been placed. The Centipede moves three spaces on top of the Hive and must end its turn on another piece which isn't in a stack. The piece which the Centipede finishes on then swaps places with the Centipede's original position. 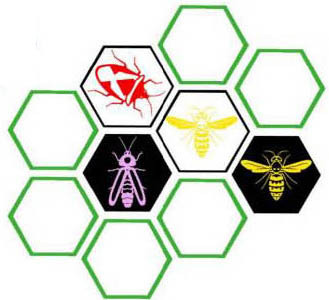 The one Hive rule must always be upheld; the Hive must not be broken, even whilst swapping the two pieces. The Shieldbug moves two spaces, one up onto the Hive then one down to end its turn on the ground level. It cannot be moved , flipped or removed from the Hive by any enemy piece, nor by any friendly piece it is touching. When the Shieldbug is covered its powers are disabled. The Tick alternates between moving one space up onto the Hive followed by one space back down again on the following turn. It cannot move along on top of the Hive. Or, it can use its special ability: Mind Control. This allows the Tick to take control of any enemy piece it is adjacent to at the same level of the Hive. It make the enemy piece use its own special ability, e.g another piece, or move the enemy piece using using the piece's own movement. Note: All existing Hive rules must be adhered to when moving an opponent's piece or using its special ability. The Tick cannot use the Scorpion or Shieldbug's passive special abilities. Both players use the some configuration of face up pieces and cannot flip them during the gome, Or a piece must remain on whichever face it is ployed.